Students take a test in Bucksport in this April 2014 file photo. BANGOR, Maine — As students wrap up the first year of testing under the new Maine Educational Assessment (MEA), Maine’s teachers union on Monday released survey results that are strongly critical of the standardized exams. The Maine Education Association said 350 teachers from across the state responded to the survey. Of those respondents, 62 percent said they experienced technical difficulties while giving the test, and 50 percent reported that testing took more than the projected time to complete, resulting in more loss of learning time. 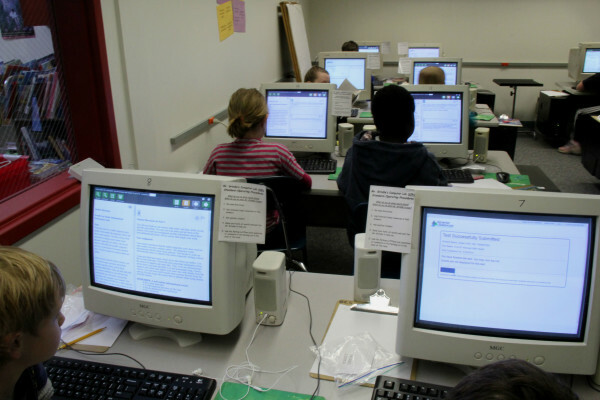 Among the technical problems reported were frozen computers and connectivity issues that kicked students off the testing site, multiple times in some cases. Some devices cut off columns and text boxes, meaning students couldn’t read some words on the screen. Some districts had students complete the test on iPads, and had problems with the keyboards and the devices’ battery life running out before the tests were complete. The survey did not look at the state’s revamped SAT, issued to high school juniors. Last year, the state hired New Hampshire-based Measured Progress under a $4 million contract to build Maine’s new state-required math and English language arts assessments. They replaced tests developed by the Smarter Balanced Assessment Consortium, which the Legislature voted to dump after their debut year. The tests were criticized by some teachers, parents and students for taking too long to complete, being poorly worded and difficult. In the release announcing the survey results, the Maine Education Association quoted five teachers from across the state, most of whom expressed frustration about the amount of time devoted to and focus on testing in general. Rachel Maloney-Hawkins, a teacher in Portland, said that she’s not against testing, when it provides immediate feedback and information that can help a teacher quickly help a student. She cited the NWEA as an example. “Giving a kid a test, like the MEA, with such theoretical high stakes with such little to tie to what we’re learning in the classroom or even a semblance of good teaching practice is frustratingly infuriating,” Maloney-Hawkins said. The Maine Department of Education did not immediately respond to an email requesting comment Monday morning. Some testing times were longer than projected, and some teachers reported computer freezes and students being kicked off the testing site while taking exams, but those issues were resolved quickly, Webb said. “In our opinion, Nancy Godfrey, [Maine Department of Education testing coordinator], and Charlene Tucker [of Measured Progress] did everything in their power to address issues and respond quickly to the field,” Webb said. Meanwhile, tension persists in the battle over Common Core Standards in Maine. Last week, Gov. Paul LePage drafted a letter vetoing LD 1492, citing his belief that the bill would launch an unnecessary review process and another layer of bureaucracy. The bill originally proposed to repeal use of Common Core Standards in Maine, replacing them with state standards used before 2010, and convening a group to set new statewide standards for use post-2017. It was later amended to establish a “content standards review committee” and authorize the Maine Department of Education to adopt rules around its recommendations. The state already has a standards review process outlined in statute, LePage argued, and this bill would make that process worse. On Monday, the House voted 145-1 to override LePage’s veto. The Senate is expected to take a veto override vote later. Discontent over the tests in Maine districts could prompt more parents to take their students out of testing, which has proven to be a challenge for a growing number of districts in recent years. The Maine Department of Education continues to warn districts that if participation drops below 95 percent on required tests, then federal funding could be lost.